This last weekend Robin and I attended the three-day long speculative fiction convention in Richmond, VA, otherwise known as RavenCon. I realize that there are a few of you out there now who have read both The Crown Conspiracy and Avempartha and would prefer I was chained to my keyboard, or had my legs broken by Kathy Bates, insuring I do nothing but finish book three. I’d rather like that too, well not the broken legs or chains, but the time to write. For the last few weeks, I have had preciously little time in that area. I am reminded by those who promote me (namely Robin) that it is just as important (perhaps more so) that I cultivate an audience for the books I already have published. So while I was just getting on a roll and making great headway on Nyphron Rising, I stopped, packed up the car and headed down to Richmond. 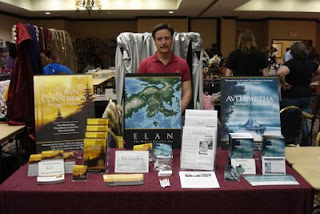 Until I started promoting my first book, I had no idea what a fan convention was, now I discover there are dozens. Most of them are the same thing held at different times of the year in different locations, many of them close to each other, so that the same people appear at each. Some are older, some are larger, but they all appear to be the same idea. Writers and artists of reasonable note are guests who give talks, readings or serve on panels discussing topics of interest to the fandom. There are an assortment of activities such as movies, shows and bands; a gaming room where those interested in table top games converge, an art room and the dealer’s room. I was in the dealer’s room, a large hall in the hotel filled with vendors selling everything from board games and dice, to medieval clothing hand-sewn from hand woven cloth. There’s always a handful of not so famous authors who use the venue to introduce their books to an audience of genre fans. I was one of those and spent three days behind a little table stacked with my books. Yet even in such a richly targeted environment, it isn’t easy to convince people that a book you wrote is worth buying. I discovered early on that the bar of expectations for authors in the dealer room isn’t set very high when a woman purchased The Crown Conspiracy. I asked what it was that sold her on it and she replied, “I read the first page and there wasn’t a single misspelled word!” It wasn’t exactly the kind of vindication I was looking for, but it got her to buy it, and more importantly to read it. If you’ve been following this blog you know that I went to MarsCon back in January, and to my delight several people who visited it came to RavenCon. I knew who they were instantly—they were the ones who walked directly up to my table, picked up Avempartha and said, “Sign it. I loved the last one.” Better than this, as I had hoped, a few people bought Crown saying a friend had bought it at MarsCon and raved about it. Despite this, there were no lines waiting feverishly for me to sign their copy, and we sold only a handful more than at the last Con making us wonder if attending these cons is worth the effort. I am signed up for at least one more “ConCarolinas” in Charlotte NC at the end of this month (May,) I will have to see what transpires there before making a decision. With the publication of Avempartha, and all its associated marketing materials out the door, I can at last relax a bit and get back to, well…work. Unless reading this post is the first you’ve heard of me, you know that the six books comprising the Riyria Revelations series are complete. Complete is however, a relative term. The story is all there and I have gone over each volume enough to say they are in better than draft form and yet those who proof and edit for me might not so much agree. In anticipation of a general audience, they delight themselves in crash testing my work, looking for weakness, confusion, inconsistencies, and screw-ups. In this way, they submit to me arguments for adding new sections or hacking out passages. The whole first chapter of Avempartha, (a scene detailing the attack on the Wood family that led Thrace to journey to Colnora), was cut from the book. The third chapter concerning Arista’s trip to Ervanon, was at first cut, (because of its long-winded historical nature that everyone felt would bore readers to tears), then replaced, (because it was determined that the information was important), then extended for clarity’s sake. Other minor plot-holes led to massive rewrites to patch them—all of which made the book better. Following this comes the detailed and lengthy process of line-editing and proofing—a seemingly never-ending quest. So, story-complete, and print-complete are two very different things. This leaves me presently working on book 3 of the series entitled: Nyphron Rising. I went over it during the cold winter months then submitted the manuscript to my editors (namely Robin) who, as usual, found fault. She requested two new sections, which in reviewing the book alongside her arguments; I extended to five, much of which has to do with a consistency of presentation and an attempt to maintain the “stand alone” nature of the novels. As the series grows, it becomes harder to keep the reader apprised of previous events. I now realize that I don’t have to—I merely need to provide enough information to make the present book understandable. That’s still tricky to do using a mind that can’t forget that it knows everything about the story. but with Avempartha out the door, I can at last get back to work on it. Now if you excuse me, it’s a nice day so I’m going to prop open the garage door and tinker. Gonna need to tighten the screws on Melengar—where did I leave that three-quarter inch sentence? I was recently interviewed by the Story Institute concerning my books and writing in general. To hear (vaguely) what I sound like, listen to the podcast at: podcast. With virtual lines of dedicated readers standing in the cold April morning air, the doors have finally opened. At midnight this morning, Avempartha was officially released. What that really means is that I personally have books I am selling directly through my website and Amazon has books in stock that they are selling. The Kindle version is also done and should be live any day now. The last thing is the distribution channel into the brick and mortar stores, but that is the slowest avenue to march down. Amazon popped the cork early, going live with its sales of Avempartha on Friday. Some of you diligent fans noticed and took advantage of this. Robin put up the sales page on my website on Monday, expecting to announce it today, but once more fans found it and began ordering by mid-morning Monday! So while today is the official launch day, the book has already been selling copies since Friday evening. My name, not being a household word, is not able to command legions of fans to surround Borders and Barnes, so a real midnight release is not in the foreseeable future, but I wonder if for the next book I could do a virtual midnight release. Perhaps when we are not so harried as we were this time, I might be able to organize some kind of chat event, and maybe all of you can come…and bring a date. So far sales have been pleasantly brisk, and I want to thank all of you. The Crown Conspiracy was published through a small press with limited resources, and Avempartha has none at all. Robin and I have worked incredibly hard to make a success of this series, but we simply can’t do it alone. We don’t have the resources or funds to advertise. I have met people who think once you’re published you’re automatically a millionaire. I’m not even a hundredaire. In fact, being a published author is little more than an expensive hobby. My wife Robin has been a saint. She has worked tirelessly as my publicist trying to get the word out that my book really is worth reading. It isn’t easy. Who’s going to listen to the wife of the author? Still, she strives, and miraculously, she succeeds, but even so, she can only touch so many. We attend cons, and do numerous book signings. We exploit the Internet as best we can, but it will never be enough. We simply don’t have the visibility of the big publishers. I can’t afford to put a full color end-cap and reserve shelf space at every Barnes & Noble and Borders bookstore across the country. I don’t have the clout or connections to draw the eyes of major reviewers. My hope of success is doomed to failure despite anything Robin and I can do. But there is one hope—you. The only way The Riyria Revelations will ever succeed is through word-of-mouth spread by fans who enjoy it. In my mind, it is like a giant wheel that Robin and I have tried to turn, a pump we have endeavored to prime. It is too large for the two of us to move much, but at some point, we hoped there would be a momentum that would spin the wheel on its own. It’s a long shot, and we knew that going in. As it happens however, it feels like the wheel is starting to turn. The wheel it seems is starting to turn of its own accord. The books are building a life of their own. Interest is sparking an engine that is slowly sputtering to life, and all of this is your doing. Like I said, Robin and I have worked very hard for a very long time, but none of these most recent developments have been our doing. The wheel is turning now because of your interest, excitement, and kindness. People are spreading the news, sharing the books, posting on websites, nominating it for reviews, for reader’s groups. Each day I watch the great wheel creak and turn. It moves very slowly, but I don’t think it is my imagination anymore. It is turning, and that is very exciting. I want all of you out there, those who mentioned my books to someone else, who gave one of my books to a relative, or bought one for a friend; those who did a review on Amazon, or Goodreads, or on a blog, to know how happy you made me. Royce thanks you, Hadrian thanks you, Robin thanks you… and I thank you. You’re keeping us all alive.